At CE Strategies, we deliver premium quality service that exceeds expectations by providing essential tools and expertise to First Nation communities. Our objective is to build trusting relationships with our clients through respect and an understanding of their cultural values. We combine traditional methods with leading-edge technology to guide informed decision making. Our approach emphasizes the protection of traditional lands and cultural values, planning for sustainable development, and capacity building. CE Strategies is a Northwestern Ontario based company consisting of skilled and experienced professionals. We provide a local source for customized solutions that align with each community's needs and values. Our company has successfully completed over 150 projects with 35 First Nation communities since 2010. A user-friendly, web-based GIS solution that ensures effortless and secure access to your maps and data. 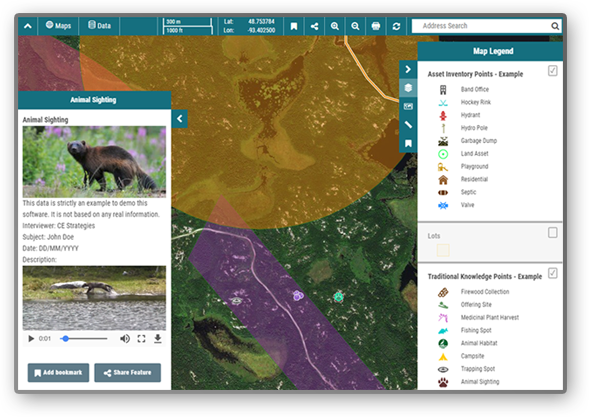 GIS technology gives you the power to combine, analyze and view all of your community’s information in one central location. A creative solution for efficient and effective management, decision making, and planning for First Nations in Canada. The Community-Based Land Use Planning process defines a vision for the future use of traditional and community land. We work with First Nation communities to establish guidelines for protection of cultural and natural values and sustainable development. Collecting traditional knowledge is essential to environmental, spiritual, and cultural knowledge being passed down to future generations. Our tried and true interview techniques provide a means for the effective recording and preservation of traditional knowledge for First Nations in Canada. Our goal is to help communities prosper, by delivering tools that provide the groundwork for future planning, sustainability, and economic development. We aim to exceed client expectations by applying the knowledge, skills, tools, and techniques required for success in every project. Our community driven approach emphasizes communication and ensures success. Building capacity is a key component of self-sufficiency, sustainability, and future success for communities. Our training courses are customized for each client, ensuring a unique learning experience.